A new feature, “GraphBoards” has been released! etc. Hello! Mackerel team’s CRE Inoue ( id:a-know) here. Last Saturday, Mackerel successfully held its’ first Hackathon event, Mackerel Plugin Hackathon #1. A new feature, “GraphBoards” has been released! With this update, we’ve released a new feature called “GraphBoards”! So what does this feature do? 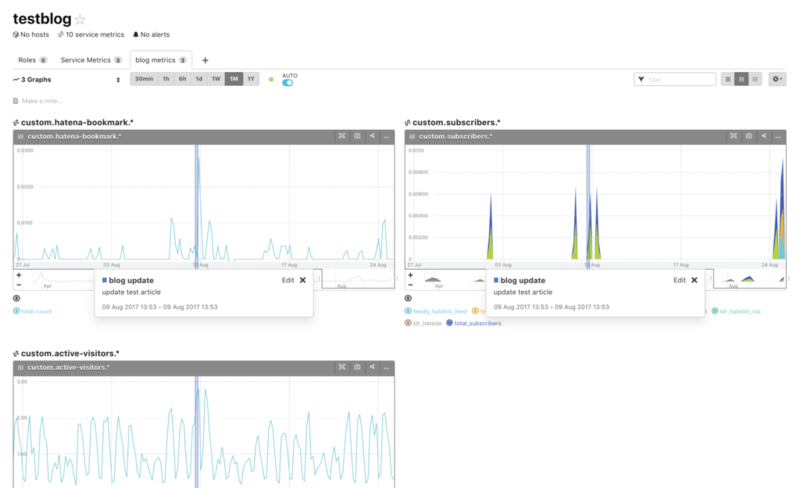 This feature is like dashboards, you can select any role graph or service metrics graph of that service and freely rearrange the layout. It’s ideal for users who have numerous roles or are using a lot of service metrics. It’s also possible to create a more intuitive layout just by dragging and dropping! Use of the automatic update feature and switching between display intervals is possible for any of the arranged graphs without having to change to another screen. Check out the help page below for information on how to create and configure GraphBoards. For monitoring rules created in Mackerel, you can leave notes such as “If this alert goes off, check —— first” or “If —– or —— occurs, this alert will occur”. Display for the content of these notes in alert notifications is already supported with some channels such as Slack and HipChat, but with this update, the note content is now also included in the body of mail notifications. We believe that this will help make troubleshooting smoother than before. [aws-ec2-ebs] Burst Balance metrics were added. check-disk plugin was newly added. [postgresql] The database name can now be specified with the database option. The Mackerel User Group, a group of Mackerel user volunteers successfully held their third event, the Mackerel User Group Meeting Vol.3, on Wednesday, August 23rd! On the day of, Lightning Talk consisted of presentations about useful tools and even a Mackerel game! It sounds like the event got pretty exciting. For those of you who unfortunately couldn’t make it this time, please join us at the next User Group Meeting! Mackerel is scheduled to run a booth at CEDEC 2017 from Wednesday to Friday next week. The event will be held at Pacifico Yokohama. We will be exhibiting on the third floor of the venue. Additionally, Sone ( id:Soudai) , Mackerel CRE, will be speaking in the session “Enjoyable performance monitoring with Mackerel”. If you’re planning on attending the event, definitely stop-by our booth! Graph annotations have been released! etc.